NSCA’s Guide to Sport and Exercise Nutrition CE Course offers research from respected scientists and practitioners to help professionals improve client and athlete performance by applying sound nutrition concepts. 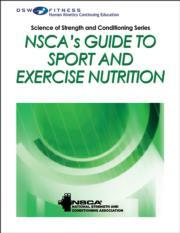 NOTE: The text NSCA’s Guide to Sport and Exercise Nutrition is required for successful completion of this course but is not included in this version. Purchase this version only if you already own the text or e-book.